Fukuoka (VNA) – Many Japanese investors still lack information about Vietnam’s real estate market, heard an investment promotion workshop held by TMS Group in Fukuoka prefecture of Japan on April 10. Sumio Hara, Chairman and General Director of the So Kikaku Sekkei construction design company, told the Vietnam News Agency that to Japanese people, Vietnam is a leading investment destination in Southeast Asia. However, he hasn’t known much about the property market in Vietnam. If more detailed information about the market is provided like through this workshop, the Vietnamese market will possibly become the top destination for Japanese property investors, he stressed. Addressing the event, Vietnamese Consul General to Fukuoka Nguyen Phuong Hong said her office is ready to support enterprises in the Kyushu region, in which the prefecture is located, who are interested in investment and business chances in Vietnam. She cited the results of a recent survey conducted by the Japan External Trade Organisation (JETRO) as finding that 70 percent of Japanese firms in Vietnam intend to expand their business activities, a relatively high rate compared to those in other countries. Meanwhile, in a poll by the European Chamber of Commerce in Vietnam (EuroCham Vietnam), 90 percent of the companies interviewed rated Vietnam’s economic outlook as stable and improving. Hong said enterprises’ optimism about their business prospect in Vietnam and the Vietnamese economy’s rapid growth are the main factors attracting foreign investors’ attention to the local real estate market. 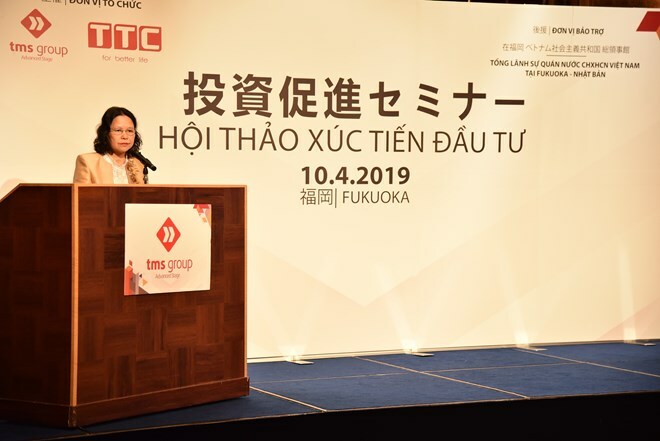 The workshop in Fukuoka was among a series of events held by TMS Group in Japan to introduce Vietnam’s investment climate and seek potential partners for this firm’s property projects in Vietnam. Vice Chairman of the TMS Group Vu Van Trung said nearly 500 investors, including many major ones, took part in three workshops organised in Tokyo, Osaka and Fukuoka from April 8 to 10. They expressed their interest in his firm’s projects in real estate, health care, agriculture and education.